I have one dog and my family is often not home. For several hours a day, five days a week, my dog is left alone. Should I get a second dog, and why would it help? Dogs are pack animals, meaning they have an instinct to live among a group. It is not natural for a dog to be alone and it can sometimes be hard for them to accept it. They look at the world differently than humans. To them, there must be an order in their group, a leader, a boss of the household. In their minds, everyone must have a place, from the leader on down to the lowest member of their group. In order for humans and dogs to coexist happily, humans must understand the dog’s instinct to have an order and understand how to show the dog where his order in the family is. When dogs live with humans, the humans become their pack. Dogs must be shown they are last in the pack order. What does this mean, "last in the order"? It means the dog looks at all the other humans in the family as the bosses, his leaders. He will happily follow their commands and accept that they are his bosses. Believe it or not, dogs are very happy to be last in the pack order. A dog becomes unhappy and stressed when the order is not clear to him and he feels he needs to test the order. When a dog is separated from his pack he may become worried, stressed and unhappy, sometimes leading to Separation Anxiety. A lot of destructive behaviors stem from dogs who just cannot deal with being separated from their packs. A lot of unwanted dogs in pounds are there because of behaviors which stemmed from the stress of being left alone without their packs. It is very common for a dog to be perfectly behaved while you are home, yet destructive and untrustworthy while you are away. There are many things one can do to curb or cure this behavior, like crating the dog while you are gone. However, while crating the dog stops your furniture from being chewed, it does not cure the dog from being unhappy and miserable. We humans have busy lives, and while we are focused on our tasks for the day in order to keep the household running (i.e., earning a paycheck, and the kids going off to school), the dog sees his pack all leaving him behind, with no understanding of why everyone is leaving and not bringing him along. So, what can we do to help our dogs cope with living among a busy human household that must leave him behind on a regular basis? The first thing you want to do is start exercising your dog with a long walk right before you leave for your busy day. This will put the dog in a rest mode while you are gone. Whether you have one dog or a whole pack of dogs, a long, daily walk is paramount. Not just tossing a ball or running around the yard, but a real walk, jog or hike. When a dog is lacking in exercise, his energy bottles up inside him. Just as birds have an instinct to fly, dogs have in instinct to migrate. Running around your backyard does not curb this migration instinct. This can cause a bunch of behavior issues. Have you ever thought of getting a second dog? Busy households that must leave their dog home alone for long periods of time may wish to consider it. This may not cure a dog from chewing your trash while you are gone, as half his pack is still leaving him, and heck, there's something tasty in there after all! However, your dog will be happier. I have heard of countless stories of old dogs becoming active again, playing with the younger dog, and a skittish dog coming out of its shell when introduced to a second dog. Sometimes dogs are just happier living with another fellow K-9. For those of you who have never owned two dogs, it is instinctual for the dogs to compete to see who is first in the pack order. Humans should be so clearly the leader that the issue of boss never arises in the dog's mind. This can be accomplished with no yelling or hitting involved, just some simple behaviors on the humans’ part. 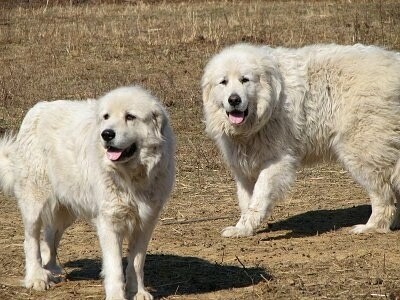 Challenges between two dogs should be stopped by the human, making it clear it is not acceptable. For the average dog owner, a general good rule for adding a new dog is, when you take in new dog you make sure the new dog has the same or lower energy level than the current dogs and is middle of the road or a submissive type. That is ideal for a good combo that does not require an expert dog owner to make it work and keep peace. 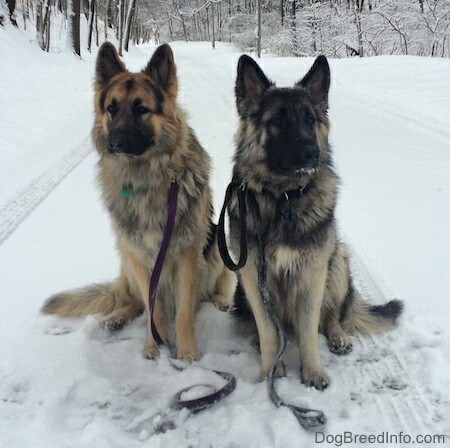 When an additional dog moves in that is higher energy or more alpha than the current dog the adjustments in the relationship are difficult as the pack has to totally re-do the order and all the dogs have to work it out. An owner who does not know how to guide it into happening peacefully can find themselves with all types of issues. Mojo, a 7-week-old German Shepherd Dog puppy, with Fluffy, a 4-month-old mixed Fox Terrier. "I got Fluffy first, and he was very shy and fearful during the first few days. He would hide and show shyness when approached. Then I got this l’il cute Mojo. She was very inquisitive and very playful right from the first day. At first I feared that Fluffy would bite and snap at her, but they became friends and they still play a lot together. It seems that Mojo is the dominant one now though she is only 7 weeks old. 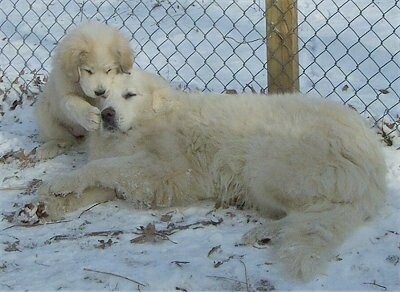 :P"
"I adopted a 7-month-old Great Pyrenees to work on our farm. He was an outside dog, obviously, he cannot protect the herd inside the house, and therefore was not part of the human pack. He was meant to bond with the goats and live among them. He was extremely skittish, and I knew this when I adopted him. He was so upset and afraid of everything that he drooled most of the time and hid in his dog house." "He was supposed to be a working dog, living with the goats and keeping the foxes, raccoons and opossums from eating the chickens. Months went by, and he remained skittish, afraid of his own food bowl and extremely skittish around humans he was unfamiliar with, including my own children." 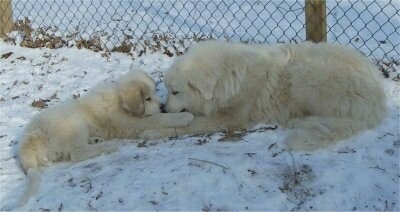 "I went out and bought him a female Great Pyrenees puppy to work with and the results were amazing!" "The first day I brought the puppy home, my skittish Py forgot he was afraid of my kids, came out of his doghouse, jumping around like the happy Py I knew he could be." "We adopted Jedi, a Jack Russell from a friend when she was 1 year old. Jedi bonded with my girls, and our 2-year-old Shepherd/Collie mix, Bailey, immediately." "In January 2006, we adopted a rescued Shepadoodle puppy to keep Jedi company while we were away at work. Just recently, after months of sitting together looking out the window and barking at the squirrels, Jedi was finally able to teach Koda the puppy how to howl."